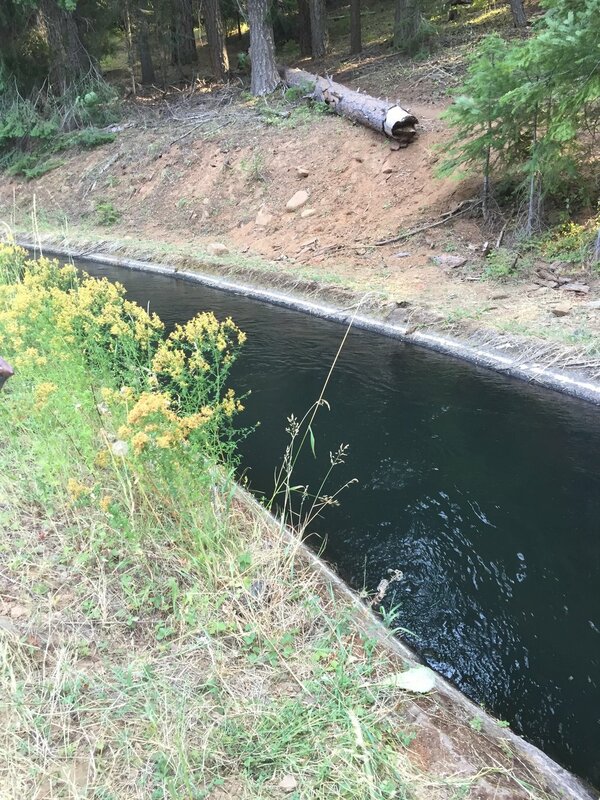 We started hiking on Day 47 with a discussion of what we call trail maladies. It seems that there are six basic problems that affect a hiker: hunger, thirst, cold, heat, soreness, and tiredness. The first three of these can easily be prevented or dealt with throughout a hiking day, assuming reasonable supply planning. The others are more challenging and either can't be helped or require a solution that includes not hiking. We have found that any one of the maladies can be easily ignored if the others are absent, but add a second and the situation becomes tenuous. A hiker dealing with three at a time is in serious danger of derailing the day. We learned early on to eat before we feel hungry, so we fuel early and often. I know I have a high water requirement so I carry plenty and sip frequently. Macro gets cold easily and starts with an extra layer in the morning although it means an early stop to take it off as the day warms up. And yet. Somehow, yesterday we let ourselves fall victim to too many maladies each, and had no chance of meeting our aggressive goal. We were both tired to start, it was another blazing day, Macro whacked his ankle & didn't drink nearly enough water, and I kept walking on sore feet when I should have given them an earlier break. No wonder we had to adjust our mileage goal downward, and then made a disheartening wrong turn in the evening. We resolved today to better recognize and prevent these maladies to increase our enjoyment of every day on-trail. We crossed Hwy 140 and started up the lava-strewn slopes of Brown Mountain. We were surprised not to have heard about more lava from NOBOs in the past week, then realized that it was really more like "starter lava" trail, as the large crevices between black volcanic talus had been filled with red volcanic gravel, and the trail tread on top of that was a wide and flat surface of soft brown dirt. Ah, the ease of trail construction in non-wilderness areas, very near road access! It also struck us how much older this flow must be compared to the lava near the Three Sisters, as we walked through many stretches of mature Douglas Fir forest growing right from the lava. We appreciated the shade of these frequent forest patches, and the sweet views of McLoughlin from the more open areas. We kept our eyes peeled for potential campsites, and were especially happy with our decision to camp at the creek last night when we found that the first remotely campable spots were nearly 5 miles in, all were tiny, and all seemed likely to have been occupied last night based on timing of hikers we passed. Our potential goal from yesterday was the South Brown Mountain Shelter, just over 10 miles in and said to be well-stocked with trail magic most of the time. Back at Shelter Cove, Dreamwalker's dad had said they even brought in watermelon, and I had been secretly hoping for some in the days since. We ran into NOBO Sprout (who shared freshly growing mung bean sprouts from a re-purposed gelato container in his pack) around mile 6, and found out he had camped near the shelter last night. He said there was magic there - all the beer was gone, but there should still be some apples and maybe some sodas. I was disappointed about the watermelon, but not surprised given the sheer volume of NOBOs. It would be hard to keep anything fresh stocked for long. We only saw ~10 hikers before reaching the shelter so we were optimistic that we'd at least get some apples and that would be a huge treat. Imagine our surprise when we walked into the shelter to find 3 ice-filled coolers. None had beer, to be sure, but there were sodas, gatorades, apples, tangerines, and a plastic tub of watermelon slices! As if that weren't enough, there was a bin with packs of peanut M&Ms in the corner. We wrote a huge thank you in the log book and enjoyed a bit of everything with our regular late- morning snack. While in the shelter, we struck up a conversation with another couple and were surprised to find they are fellow SOBOs. Rocket & Steady started 9 days before us and came in from Ross Lake on the Lightening Creek / 3 Fools route we had initially considered. It had its issues but wasn't as bad as they (& we) had feared, and they reached the border on their third day (as did we from our alternate route). They took 3 zeroes in their hometown of Portland and have otherwise been making steady progress. Macro remarked that these must be the rare but consistent southbound footprints we have seen on the trail in the past few days, and Rocket's shoes in fact were a perfect match. It turns out they camped just across the creek from us last night, and were most likely just a mile or two ahead of us the night before. 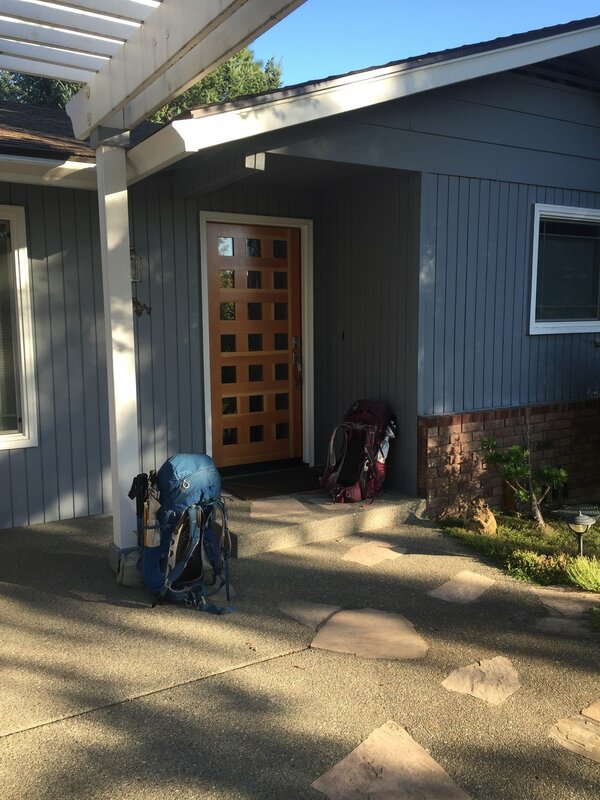 We exchanged resupply plans and learned they don't plan to stop in Ashland, so will probably pass us there and we'll catch up to them again somewhere in Northern CA. We were surprised to find a stretch of relatively lush forest that started before the shelter and continued on for several miles beyond. While there was no water to be seen, there was dense green undergrowth including plentiful huckleberry plants (sadly, no ripe berries) and moss hanging from the trees. The cool shade provided by the multilevel forest canopy was a sweet relief after the arid forest of the past several weeks and we realized that we hadn't seen such thick growth since northern Oregon. We crossed the unfortunately-named Dead Indian Memorial Highway, and were approached by a cyclist who was just turning around. He was interested to hear that we were SOBO, and asked about the number of blowdown between there and Hwy 140 (only a few) as he is involved in local trail maintenance. As a parting bit of magic, he pulled a Clif bar from the pocket of his jersey and offered it to us. We smiled, said we never turn down food, and eagerly tucked it into Macro's pack to enjoy later in the day. We noticed today that there were far fewer NOBOs than in past days and weeks. By late afternoon we had only seen ~25, and we also remarked that the hikers we were passing were much more diverse than the earlier crew. 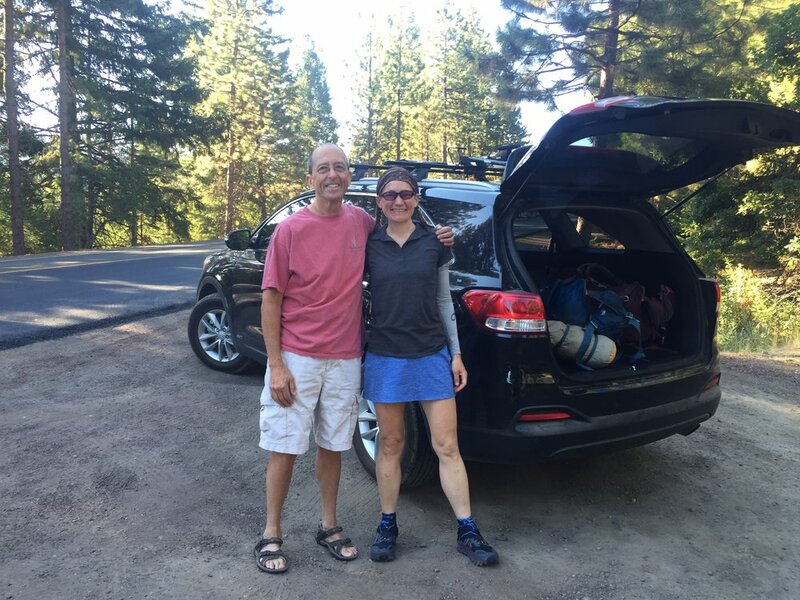 The gear, shoes, and even body types varied widely from the typical thru-hiker "uniform," and there were many more older hikers, couples, and women. Yet each hiker we asked confirmed they were en route from Campo to Manning Park. It struck us how quickly we have moved from the center of the herd to the outliers. Also, we realized that as we move further south, the NOBOs we pass have longer and longer remaining to hike. We passed our ⅓ mark near the South Brown Mountain Shelter, so that the NOBOs we are passing now have nearly 900 miles left in their journey. Within a few days, we will be passing NOBOs who are in danger of not completing their hike before snow starts to fall in the North Cascades, which can happen as early as mid-September but nearly always occurs by early October. At the same time, we are somewhere near the front of the SOBO "pack" (if there is such a thing), and feel strongly the pull of the Sierra Nevada as we near the California border. It is still a few weeks before we will be in our home range, but are well aware that our own window for completing a continuous thru-hike will now be dictated by weather in the high country and our ability to get over Forester Pass before the first of the serious storms. We left national forest and entered the first stretch of BLM-managed land that we have encountered on our hike. The slopes were still densely forested, but we noticed a lack of any undergrowth and a huge number of downed trees covering the ground. 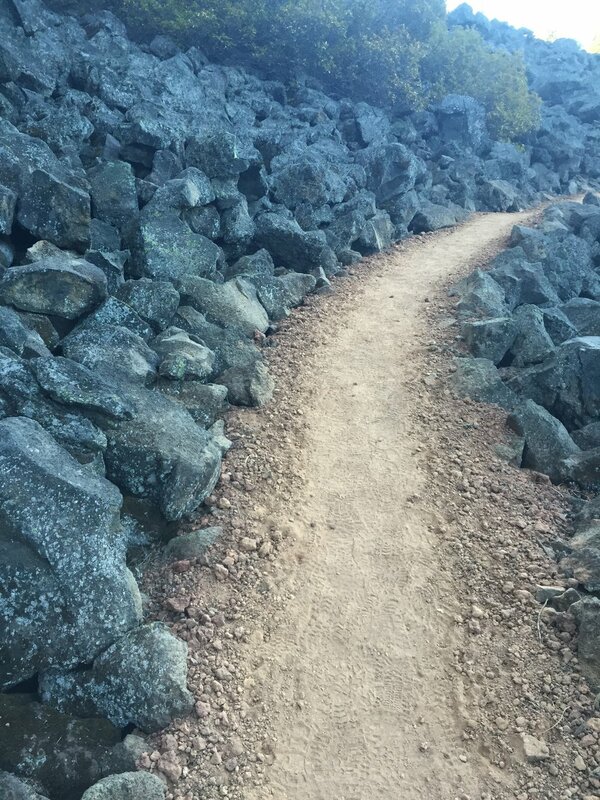 All were freshly cut, and we joked that while they may not have much PCT, the BLM is sure serious about keeping their 43 miles of trail clear. We appreciated the easy walking but did laugh out loud when we came to a solitary dead tree leaning over the trail with at least 7' clearance, but marked with yellow caution tape. So thoughtful, and yet ridiculous at the same time! 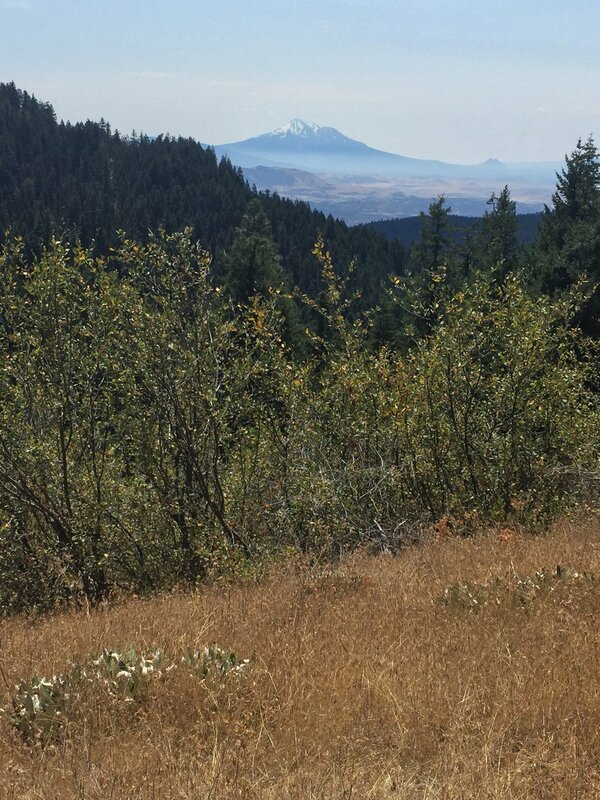 We passed a few NOBOs, who told us we were about to have a great view of Shasta and within a few minutes broke out of the forest onto a rocky point with a hazy but unobstructed view of Mt. Shasta and Shastina to the south. They were small, but closer than we expected, and it struck us that we were looking at California for the first time. 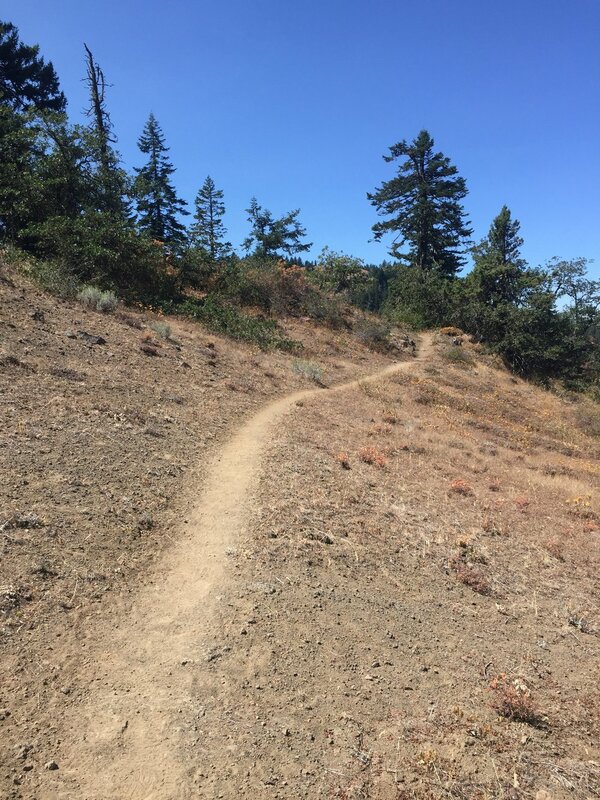 From there, we descended and passed through different ecosystems than we have seen including stretches of Sugar Pine with their enormous cones, mixed forest with oak trees, manzanita and scrub-covered slopes, and dry grassy hillsides interrupted only by the trail made of deeply cracked earth. We continued to see familiar lower-elevation plants, too, including Oregon grape, bracken ferns, and the ubiquitous Douglas Fir. 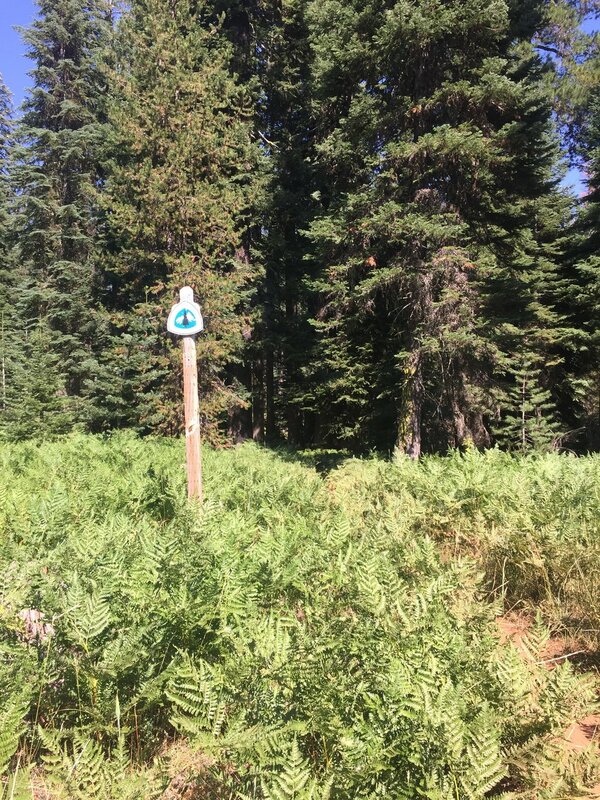 There are very few water sources on-trail, and we noted signs to a handful of springs that were a few hundred yards off of the PCT. We generally carry all of the water that we need for the day, so we didn't investigate any of them. Our goal for the night was the outlet of Hyatt Lake, a reasonable ~32 miles given the good trail conditions, plentiful shade in the middle of the hot day, and a good night's sleep. Macro had resolved to drink plenty of water today and was keeping up with that task. 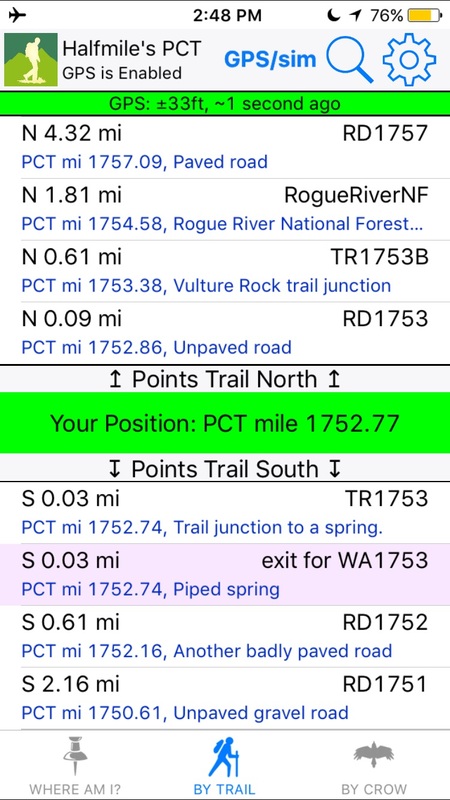 Through this non-wilderness territory we crossed numerous roads of varying quality, and chuckled when the app that lists various waypoints along the PCT referred to one as "another badly paved road." That pretty much sums up about 10 miles of trail. We started to run into more signs of civilization as we neared a few large reservoirs that host popular campgrounds. Adjacent roads had intermittent traffic, we could hear distant noise of powerboats, and saw signs for several horse camps. Past one dirt road we heard several gunshots from a few different guns and joked that it must be an unofficial firing range. The shooting continued and we kept up a constant conversation as we walked this section of trail to minimize the chance that whoever was practicing target shooting on these public lands wouldn't mistake us for some wild creature they wanted to take aim at. Next we passed a few private properties, marked by large "No Trespassing" signs along the trail. Some property owners were more vehement than others, and in on particular stretch where every single tree had a sign (and a few run-down trailers were visible in the distance), someone had made a little modification to on of th signs that made us laugh out loud. With all of this put together, it did seem like a few miles of the stereotypical rural western experience to be sure. The final several miles of our evening brought us away from the roads and people and across rolling high prairies with grassy slopes, sparse and dry mixed forest, and views of enormous and pale blue Hyatt Lake down below. We had beautiful clouds and occasional glimpses of Mt. 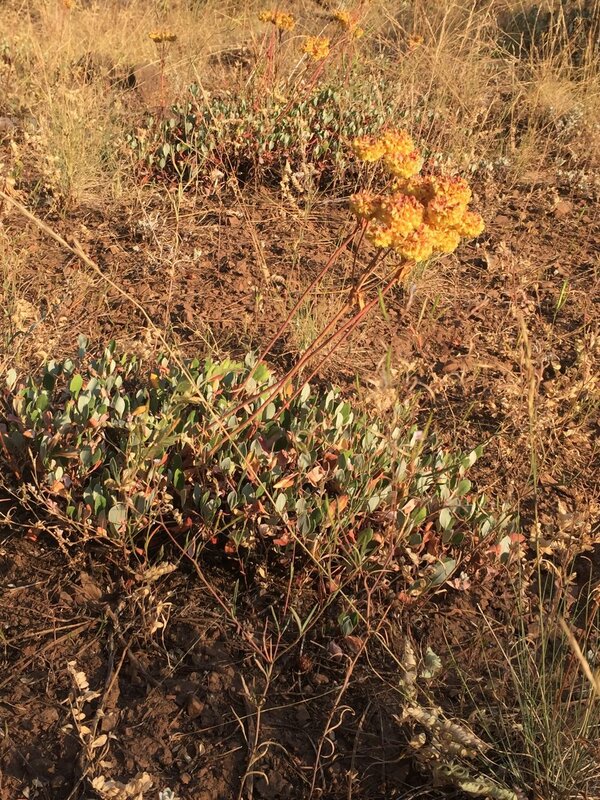 Shasta to the south, and perfect golden hour light on the desert-like wildflowers and dry grasses. We startled several deer and watched a few raptors soar overhead, and paused to let a skunk cross the trail. We even saw a black bear gallop down the slope in front of us just before we crested Wildcat Hill. The surroundings were different than anything we have hiked through, and quite scenic in the waning light of day. We were surprised to come across a spigot of potable water near the junction to the Hyatt Lake campground right on the trail, just 1.5 miles to where we would camp for the night. We took the opportunity to fill up our packs and bottles, which would mean reaching our campsite by headlamp but would also eliminate the need to filter water once we arrived. It was a pleasant evening and an easy walk through the high prairie as dusk fell then turned into dark as we crossed the outlet of Little Hyatt Lake and settled into our site for the night. Day 48 was another clear and warm day. We didn't get started until after 7am, but the anticipation of reaching Ashland and our first zero moved us right along. To be honest, neither of us expected much scenery in the last 23 miles into town, but once again the trail had a few surprises for us. 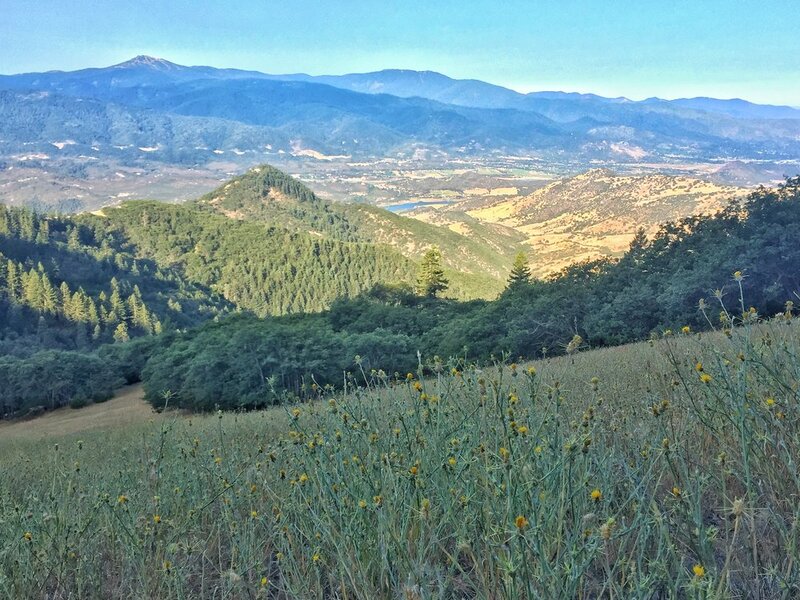 The first several miles were similar to late in the day yesterday, with patches of mixed oak and conifer forest interspersed with wide slopes of dry golden grasses or yellow star thistle. We came across a flock of wild turkey and flushed several grouse as we walked. From an open hillside we had our first view of Mt. Ashland to the southwest, and also the prominent Pilot Rock at the south end of the valley. We could see the cut made by I-5 as it comes up from California, and remarked on another day of hazy air. 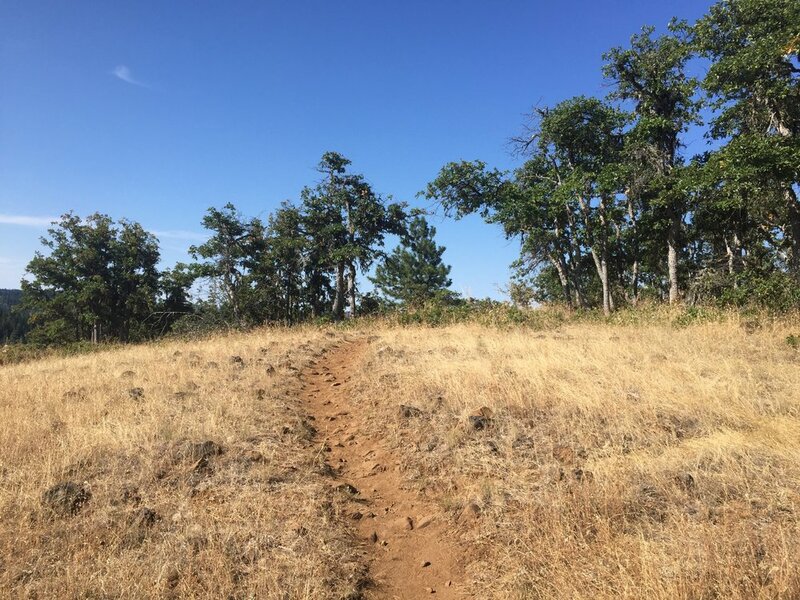 The trail proceeded to meander down the east side of the valley, entering the Soda Mountain Wilderness and taking us right past Pilot Rock before finally turning west for the final approach into Ashland. Though warm and often exposed, we enjoyed the dry but rich landscape of this lower elevation trail. From the southern facing slopes we had great views of increasingly close Mt. Shasta, and from the northern aspects we could see Mt. McLouglin recede into the distance. We sat on a hillside around lunchtime and watched a raptor play in the thermals directly in front of our view to Mt. Ashland. We definitely felt the sense of transition, from the Pacific Northwest into northern CA. Before we knew it, we had reached old Hwy 99, which we would have to walk along for just over half of a mile to get under I-5 before the trail departed into the woods to head south to Mt. Ashland. Instead of re-joining the trail, we followed the road all the way to Callahan's Siskiyou Lodge where we availed ourselves of a hose to rinse the filth off of our legs and feet, then went inside to enjoy the free beer they offer thru-hikers as we waited for our friend Bill to pick us up. Nachos, avocado & Swiss on fresh artisan bread, and peaches straight from the orchard. Add a tall glass of ice water and that's what I call a zero-day lunch! Thanks Jack for the ride back to the trail! And look at those clean new shoes. Our whole day off in Ashland was everything we had hoped for, and more. The evening we arrived we showered, did laundry, and enjoyed the company of Bill & Diane over endless appetizers fit for a few thru-hikers. Dinner was a casual and delicious affair on their back patio on a perfect evening, and ended with a bowl of fresh berries. Not having to hit the trail in the morning, we had no agenda other than sitting around and not hiking. Bill took us to the farmers' market in the morning (peaches! berries! bread! ), then they graciously left us the keys to their house and car as they were headed out of town, and we spent the day enjoying ourselves in their comfortable space and friendly little town. We found the best ice cream shop, replaced my worn shoes, mailed home a few things we won't need before the Sierra, and purchased food for a grocery re-supply that will last us to our next box that is waiting in Seiad Valley. Their hot tub was perfect for our aching muscles, and their recommendation of a wood-fired pizza place was spot-on for takeout dinner to accompany the small seedless watermelon we handily consumed. Now it's off to a second night of sleep in their very comfortable guest room before their neighbors arrive in the morning to deliver us back to the trail. While Day 49 was our first zero, it certainly won't be our last! But first, it's on to California.